FAIL: Nissan GT-R Explodes At 183 MPH! The same GT-R that lost its hood at 180 mph. 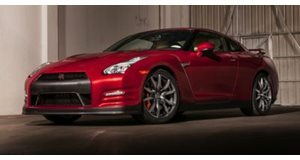 Earlier this month we saw some crazy footage of a drag race between a 1600+ hp Nissan GT-R taking on a Lamborghini Gallardo. In spite of the awesome competition between these two cars, the main highlight in this match up was unfortunately not the race itself, but the fact that the hood on the GT-R literally flew off as the car hit 180 mph. Now it would appear as if different footage has emerged of the exact same super powerful Nissan participating in another drag race and experiencing yet another mechanical failure at high speed. This time, disaster struck in the form of an explosion that occurred at 183 mph, almost the exact same speed at which the car lost its hood in the race against the Lamborghini Gallardo.